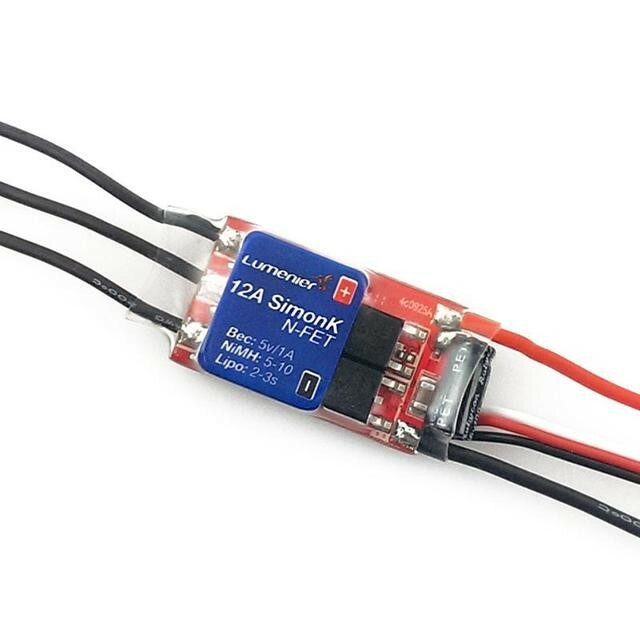 The Lumenier 12 Amp ESC are a customised ESC with SimonK firmware, this version includes the OneShot auto-detect and Active Braking / Damped Light / Comp_PWM which makes it the perfect ESC to use on mini FPV quads such as the QAV250. This Lumenier 12 Amp ESC comes pre-loaded with the latest firmware which makes it compatible with new features like "OneShot" (no soldering is required, it will auto-detect if OneShot is enabled), with complimentary PWM (similar to KISS braking feature) and is compatible with all Lumenier motors up to 4 cell. The Lumenier 12 Amp AutoShot ESC have been tested and are compatible with all Lumenier motors (RX1806, RX2206, RX2206), 2S - 4S, with both 5" and 6" propellers without sync loss issues or cogging at lower rpm's. The Simonk AutoShot firmware has been pre-calibrated with endpoints of 1060us - 1860us. These seetings correspond to the default endpoints in both Baseflight and Cleanflight, this means that a "Calibration" procedure is not necessary. Removal of the red wire in the signal cable is ok if you don't need the 5v power out to power onboard systems like the radio controller receiver, however both the ground (black) and signal wire (white) need to be connect to the flight controller. Do not connect only the signal wire alone. Customised to drive all motors without sync issues or cogging. To enable new features on Baseflight: - On Configuration tab, check "Enable OneShot" and "Enable FastPWM" - Scroll down and click "Save" To enable new features on Cleanflight: -On Configuration tab, check the "Enabled" box next to "ONESHOT125" Feature -Scroll down and click "Save"
Why use N-Fet? An ESC has either P-channel and N-channel FETs mixed or N-channel FETs only. The ESCs which use only N-channel FETs have the advantage of lower resistance, less losses and hence more efficiency. Learn more about N-channel and P-channel directly from Simon Kirby here.